Sammy is bringing up the rear in this whirlwind week of earnings results, today outing figures for the second quarter 2013. While there were plenty of positives to report, Samsung cautioned that the next few months might not be the rosiest. 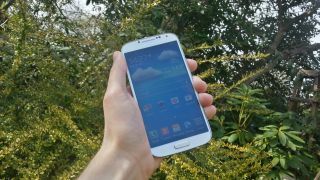 As it brought home a net profit of 7.77 trillion won (about $6.98b, £4.52b, AU$7.55b), the Galaxy S4 led the way in phone shipments. It along with the Galaxy Note 8.0 pushed the mobile division's profit up 9 percent from the previous quarter. However, Samsung warned that while the sales in the sector should remain strong into Q3, the pace of phone growth is expected to slow. Third quarter smartphone sales are expected to outperform global market forecasts, Samsung noted, with low- to mid-range smartphones helping boost the non-feature phone sect compose more than 70 percent of its handset offerings. The company said it plans to "reinforce its market leadership in tablet panels by expanding" its high-res and mass market display line-up. It also plans to focus on offering "differentiated smartphone displays," competing on a technological front with flexible displays, among other unnamed offerings. Premium TVs and air conditioners helped the consumer electronics division see a 14 percent sales jump from the last quarter. Strong seasonal demand will help premium TVs grow in the second half of the year, and a smattering of offerings - from UHD to curved OLED to Smart TVs - will help Samsung take on competitors, the company said. Google seemed mighty un-bothered by its Motorola problem.